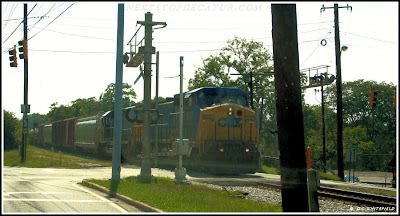 I had to do a repost of my Next Stop...Decatur Time Machine post from July 2008 after seeing the Mayor talk about Decatur this morning on the zip trip visit from CBS channel 46 Better Mornings Atlanta show. I'm so glad someone looks at my Time Machine photos. coincidence, you be the judge. 106 East Ponce de Leon Avenue, Decatur. This building, constructed in 1924, was originally built to serve as a Masonic Lodge. The official name of this building is the Pythagoras Masonic Temple Building, at least according to a sign on the northwest corner of the building. Today, the Masons still meet in the building, on the third floor. The first and second floors are rented out, however, and among the tenants are Dekalb County's Dispute Resolution Center and the Temple Gallery, which is run by the Dekalb Council For the Arts. Take a look at Glenn's Pharmacy, that looks so classic. 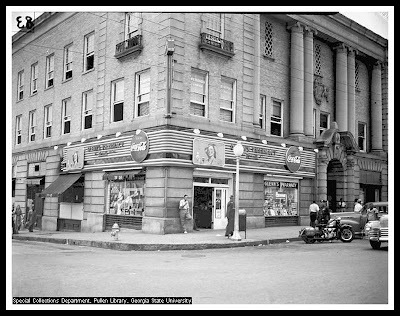 What they should do is restore that corner of the building back to look like that and have another pharmacy in that spot with a lunch counter, if they did that it would give that area alot more attention. 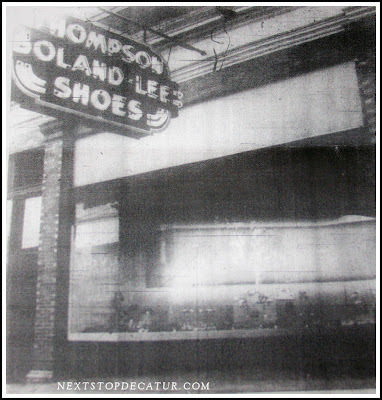 I think Decatur needs to connect the new section of stores down towards Ted's Montana Grill with the old section of Decatur, something needs to be done to make a better transition between the two areas. Click photo to play video. Better Mornings Atlanta hit the road early...they are at Parker's on Ponce this morning on a zip trip...looking for some of the most interesting towns in metro Atlanta. Corinna Allen was live in Decatur this morning 5 - 7 a.m. Yes, I said 5 a.m. - 7 a.m.
Dan Magee sends this in. activities and games specifically for pre-teens and teens. Better Mornings Atlanta is hitting the road...they are going on a zip trip...looking for some of the most interesting towns in metro Atlanta. On Thursday, April 30 BMA and Corinna Allen will be live in Decatur from 5 - 7 a.m. Yes, I said 5 a.m. - 7 a.m. (that's morning for all you late-night folks). They are showcasing everything that makes our community a great place to live, work, and play. They are spotlighting our businesses, shops, restaurants, events, and people, throwing in a bit of history and asking people what they love about our community. How hip is our zip? 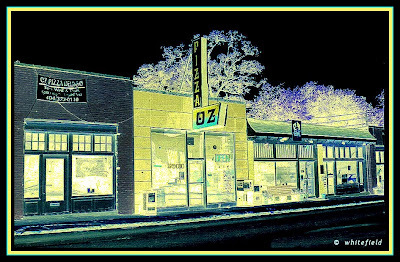 Let's show Better Mornings Atlanta by turning out from 5 - 7 a.m. at Parker's on Ponce, 116 E. Ponce de Leon Ave., and showing our community spirit. The more the merrier. We'll have free coffee, soft drinks and bagels to help you wake up - plus the Rain Barrel Man, an Asian Cajun fashion show, and more. Please join us in showcasing our fabulous community - we need you. Mingei World Arts sent this in. This Oscar nominated short documentary will be screened at the Decatur Library this Thursday evening, a preliminary event for the Green Fest. The film, created by producer Mike Glad and director Leslie Iwerks, tells the story of the families living on the Guatemala City garbage dump, and the organization, Safe Passage, that created a school for the children there. The screenings will be followed by a panel discussion featuring Safe Passage representatives and experts on related environmental issues. 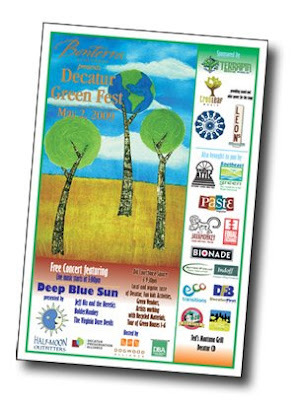 Join us this week for Decatur's first annual Green Fest! Rain barrel auction-- and more! For more on the Green Fest, click here. The pollen has dropped and the thermometer has risen and it is spring in Decatur! Please remember us as you shop for gifts and cards for Mother's Day, graduations, spring weddings and showers. We are full of goodies and more is coming almost every day! 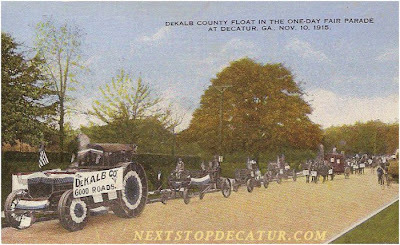 Come out and enjoy spring in Decatur. Lunch at Leon's Full Service begins May 8! 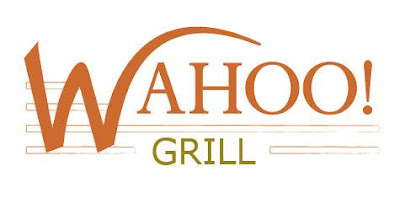 Thursday, April 30, from 7:30-9:30pm. Doors open at 7pm. Where: Decatur Library Auditorium, Georgia Center for the Book at DeKalb County Public Library, 215 Sycamore Street, Decatur, GA. Details: We'll screen Recycled Life, the Oscar-nominated short documentary created by producer Mike Glad and director Leslie Iwerks, along with a new short film about Safe Passage's Adult Literacy Program. To learn more about Safe Passage, click here. An assortment of fun, funky, clean bags made of recycled polyethylene bags from the streets of Delhi and the city dump! Conserve India, a non-profit organization, trains and pays the city's ragpickers to collect, sort and grade the plastic. The plastic is then recycled into these beautifully made, sturdy bags-- using no colors or dyes, just creatively combining the colors of the trash to produce their fantastic designs! 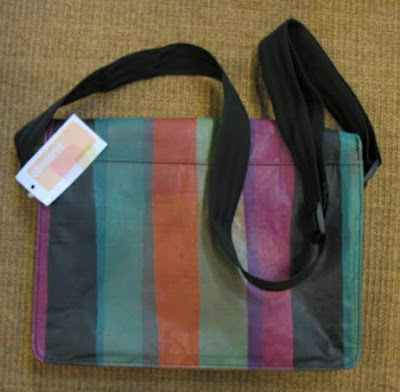 Messenger bags, totes, shoulder bags, luggage tags- a limited selection available this weekend at Greenfest! 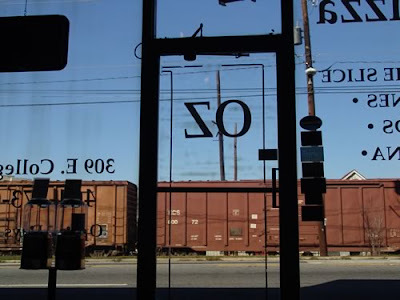 Great photo looking out from inside of the old OZ PIZZA that was on E.College Ave in the old WATSON'S DRUG store building. JD Isaacs sends this in. 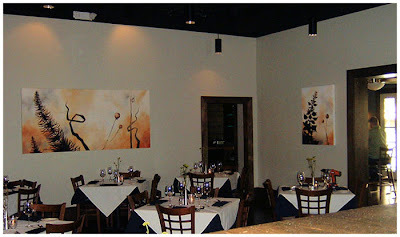 Just wanted to send along pics of my commissioned paintings that were placed yesterday into there new home, a fine dining steakhouse called Parkers on Ponce in downtown Decatur around the block from my gallery. These three paintings are oil on canvas, the largest being 90" wide by 46" high. The owner was ecstatic with the results. I hope you like them, they were a joy to paint. It's great to see JT from Parkers for hiring JD Isaacs to do this and keeping it in the Decatur family. JT and his partner Allie and JD Isaacs collaberated on the look of the pieces and they look great. Thanks JD for sending these photos. 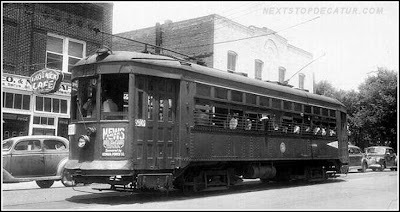 This was a header photo I made for Next Stop...Decatur, but never used it. Maybe I will in the future...maybe. The New Court House is on this block now. 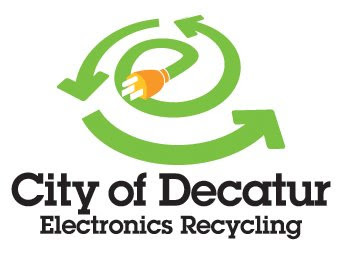 Saturday, April 25 from 9 a.m. – 1 p.m.
Decatur High School Parking Lot. A World War II naval dive bomber was recovered from the bottom of Lake Michigan today. 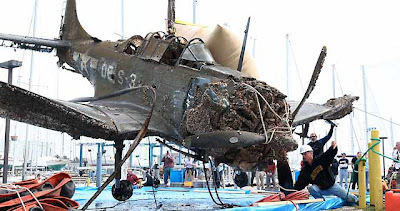 A World War II naval dive bomber was recovered from the bottom of Lake Michigan today, 65 years after it crashed on a training mission off Waukegan. It's known that the pilot survived, but it's not clear which aircraft this is, because definitive identification numbers can't be found on the plane. Nevertheless a marine salvage company in Illinios, A&T, working with a naval aviation museum, found the aircraft using sidescan sonar in 315 feet of water, 27 miles out from Waukegan. The plane was lifted from the bottom Thursday using an airbag and towed underwater into Waukegan Harbor this morning, where the j ob was completed. At 10:15 a.m. a Larsen marine crane began lifting the aircraft from the water and for the next half hour slowly raised it as brown water and black mud poured out of it. At 10:46 a.m., the crane operator and handlers with ropes set the plane down on a blue tarpaulin. The aircraft was lost during training operations during World War II when naval pilots were being trained out of Chicago's Navy Pier for takeoffs and landings on aircraft carriers. This plane was one of nearly 100 that were lost during those exercises. About 40 of them have been recovered. This morning, as the plane was lifted out of the water and gently angled toward touchdown on dry land, A&T diving engineer Keith Pearson looked at the plane with satisfaction. "This thing crashed and has been under water [a long time]. I think it looks pretty darn good, doesn't it?" How Often Do You See This. ? 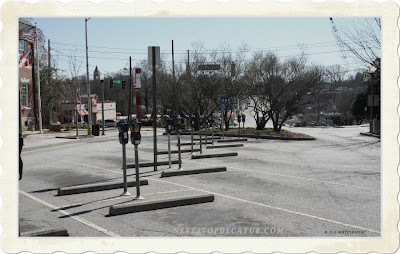 How often do you see no cars on N. McDonough St.? It’s the brawl to end them all! 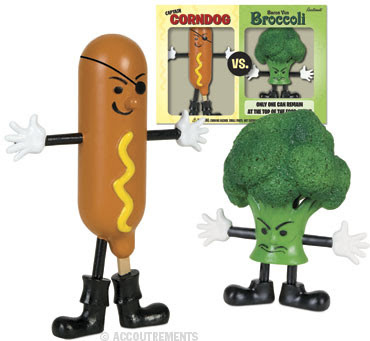 Captain Corndog and Baron Von Broccoli will settle their ongoing feud once and for all in a knock-down, drag-out battle. The winner will become the undisputed feature dish of your kitchen! Captain Corndog stands 5-3/4" tall and fights for the delicious legion of carnival food and carnivors. Baron Von Broccoli is 3-3/8" tall and represents the power of produce and vegetarians. Each vinyl figure has bendable arms and legs. DeKalb County property owners will see new assessments next month after the tax assessors on Thursday reconsidered how to set the 2009 tax values. DeKalb Chief Executive Officer Burrell Ellis asked — and got — interim appraiser Hank Ruffin to revalue property after reading in The Atlanta Journal-Constitution that the county appeared not to be following a new state law. Don’t miss our annual Spring Sale, featuring hundreds of unique items for your patio, porch, and garden. Kudzu has one of Atlanta’s best selections of garden art and vintage furniture, including: Whimsical garden figures and ornamental iron, pottery and statuary, Christine Sibley Garden Art and R.A. Miller Whirligigs, vintage gliders and wrought iron, flying pigs and all sorts of fabulous finds to enhance your garden and patios. Plus, we’ll be featuring special ‘Spring Sale Prices’ throughout the store! 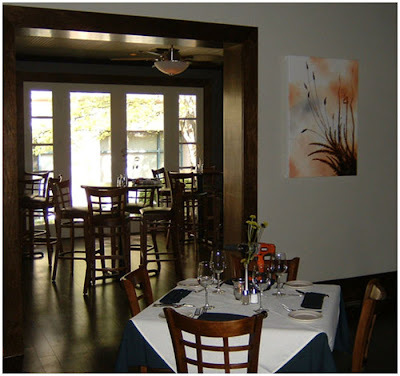 Come and discover the fun of Spring at Kudzu! I have been waiting for this season because of one episode "30,000 Rooms, and I have the Key". (An aging jewel theif steals from rooms at Waikiki hotels,then taunts the Five-0 chief with an invitation to his next performance). 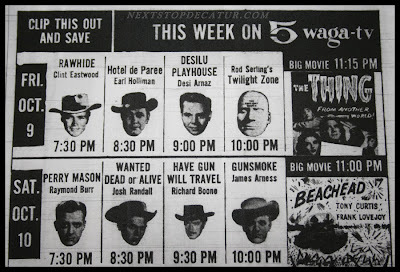 David Wayne guest stars. 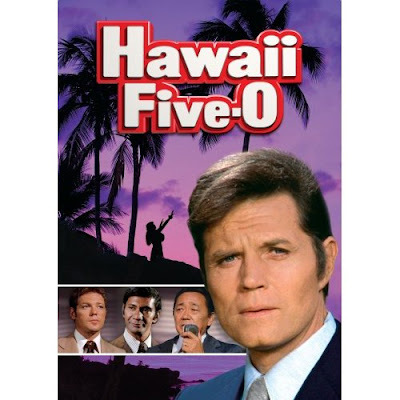 This is Jack Lord inviting you to be here for....30,000 Rooms, and I Have the Key. NEXT... 30,000 Rooms, Be Here, Aloha. Hi Dennis - I hope you're doing well. I wanted to let you and your readers know that Fleet Feet Decatur is now offering kids' merchandise - including shoes, socks, inserts and apparel. If this news is of any interest, I've included a picture as well. Fleet Feet Decatur is now offering children’s shoes, socks, inserts and apparel. The specialty retailer, which is owned by Decatur residents, will use its FIT process for kids’ shoes, looking at the bare foot and biomechanics to determine if a neutral cushion shoe or stability shoe will be best for each child. Shoes: Fleet Feet is carrying two New Balance shoes in sizes 3.5 to 7 – the New Balance 749 neutral cushion shoe and the more stable version, the 769. Both shoes offer New Balance’s great mid-foot support, as well as their proprietary cushioning system, ABZORB. Socks: Give a hug to your child’s feet with Balega kids’ socks. Made of a modified polyester material, these socks feel as soft as cotton, but include added cushioning and moisture-wicking properties to help prevent blisters and chafing. Inserts: Superfeet’s original Green or Blue inserts will provide great arch support for your child and last through a couple pairs of shoes. They even can fit into some kids’ casual shoes for better support all the time. Apparel: Nike makes some great kids’ moisture-wicking running shorts and shirts that will help keep your child cool during the warm summer. 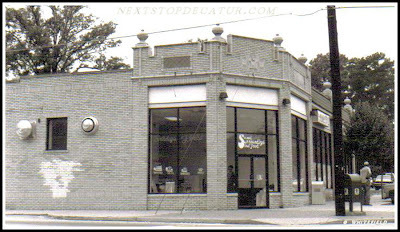 For more information call Fleet Feet Decatur at 404.371.0208 or visit their website at www.fleetfeetdecatur.com. In this 1940's picture of W. Court Sq. 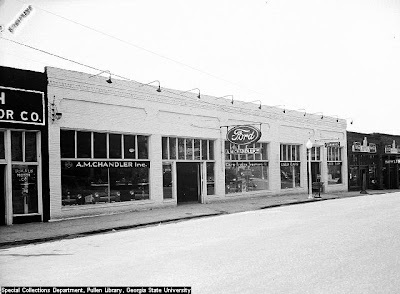 shows A.M. Chandler Inc. and Dekalb Motor Co. 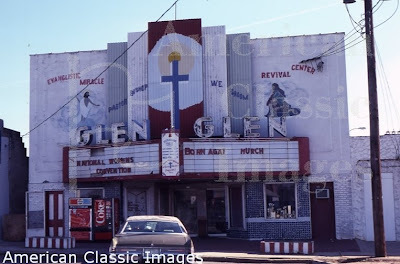 The Glen Theatre in these color photos was a Born Again Church. And today(bottom picture) the theatre building is a Pawn Shop. 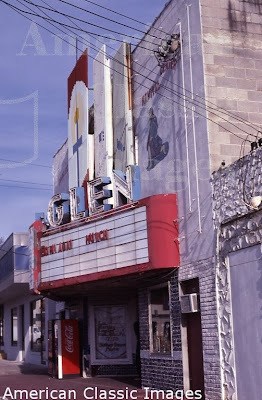 note: This is sort of what happened to The Decatur Theatre before it was torn down, it became a Church. Glen Campbell on Indie 103.1 FM. "Gentle on my Mind"
JENNIFER DANIELS is a uniquely gifted and naturally talented performing songwriter as well as an excellent guitarist with magnetic stage presence. Paste Magazine calls her "an amazing musical talent." Tonight she is releasing her fourth studio project titled, "Come Undone." Her music has celtic influences fused with Southern inflections. Fans of Ani Difranco, Dido and Sarah McLachlan should enjoy her music. Baltimore's NAKED BLUE is husband-and-wife team Scott and Jen Smith. They've already recorded 5 CDs. Fans of Shawn Colvin will enjoy their radio-friendly adult contemporary pop/folk. Nashville's DREW HOLCOMB has logged in more than 500 concert dates across the country from solo coffeehouse gigs to clubs, festivals, and colleges with his band, the Neighbors. He has also opened for Ryan Adams, Los Lobos, Susan Tedeschi, Marc Broussard, Sister Hazel, and the North Mississippi Allstars, to name but a few. That Holcomb has sold almost 10,000 CDs in the process is equally impressive given he has done it all without any major label or music industry support. Not bad for a folk rocker who calls himself a "recovering singer-songwriter." Drew's album "Passenger Seat" has currently ranked Top 5 on the iTunes Folk Top Albums. A transplant from LA, ADRIANNE was one of 50 finalists in the Coca-Cola New Music Award Competition and recently had 3 songs in the feature film "Eulogy," starring Ray Romano and Debra Winger. Adrianne has won the prestigious Eddie's Attic Open Mic Shootout, just got back from entertaining on one of the Rock Boat cruises, received the Boston Music Award for Best New Singer-Songwriter, and was a finalist in Boston's Lilith Fair Competition. Tonight she is releasing her new CD, "You Me Lonely." KYLER ENGLAND's organic pop music recently scored her the title "Hot 100 Unsigned Artists 2007" by Music Connection Magazine. Kyler's songs have been featured in many TV shows including Army Wives, Guiding Light, Zoey 101, Rollergirls, Paradise City as well as films like the upcoming "The Lucky Ones" starring Rachel McAdams and Tim Robbins. She is based out of Los Angeles, but tours over 100+ shows per year...sharing the stage with artists like Sting, Annie Lennox, Teitur, Gavin DeGraw and Melissa Etheridge. She released her latest project, "Simple Machine" just a few months ago. JEFFREY GAINES was signed to the Chrysalis Records label in 1990 and released his debut album, Jeffrey Gaines, in 1992. The first single off his critically acclaimed record was entitled "Hero In Me" which performed live on Good Morning America. However, "Scares Me More" featured an acoustic live version of Peter Gabriel's "In Your Eyes", which became an even bigger hit for Jeffrey. He was one of the artists invited to contribute vocals to the benefit CD "We are Family", produced by Nile Rodgers after the September 11, 2001 attacks with profits going to the families affected by the tragedy and "dedicated to the vision of a global family" and respect and understanding of cultural diversity. The single peaked at #9 on Billboard's Hot Singles Sales chart in late 2001 and #32 on Billboard's Hot Dance Club Play chart in early 2002. He has performed live on Late Night with Conan O'Brien, VH-1, Friday Night Videos and A&E's Breakfast with the Arts and has toured with artists including Tracy Chapman, Sting, Shawn Colvin, Edwin McCain, The Bacon Brothers and Stevie Nicks. Decatur Marta Station at Sycamore St. 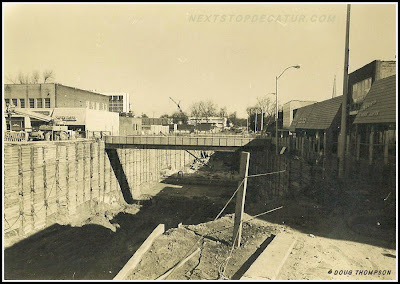 This great photo of the construction of the Decatur Marta Station was sent in by Doug Thompson. Doug took this photo in 1977. Thanks Doug for sending in this and all the others, which I will post later. 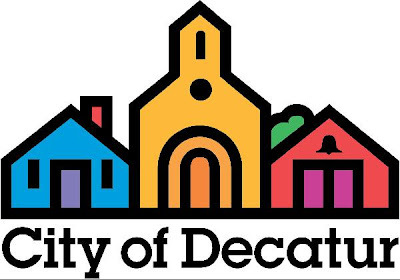 If anyone have any photos of Decatur please send them in. 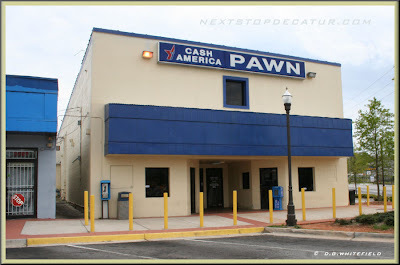 231 W. Ponce de Leon Ave. If you happened by the Decatur square Wednesday and wondered why California’s bear-on-red-and-white flag tussled on the square’s flagpole, rather than Georgia’s state banner — no, Decatur hasn’t seceded to the west. A Lifetime TV crew this week will be filming a courtroom dramedy set in small-town California in which Decatur’s Old Court House will play the part of — you guessed it — an old small-town courthouse. 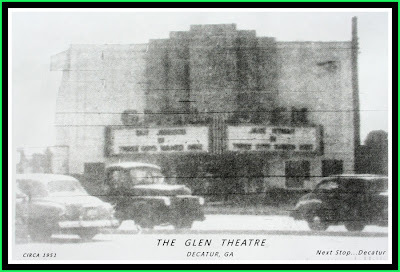 Photo is 1950 Grand Opening. see the plans for the Decatur Rec Center building. 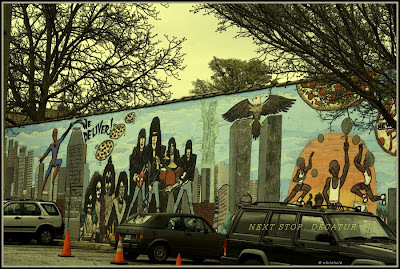 Is Decatur ready for some new Art Work ? 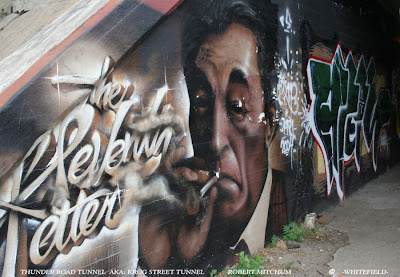 Robert Mitchum on the Krog Street Tunnel to do something new. One of the cowboys does not have his real name listed here and would later be one of the biggest movie stars in the world. Can you name that star. ? 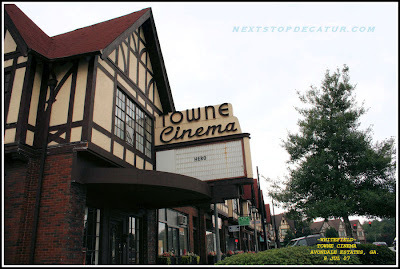 What Would You Say About a Movie Theater in Emory Village? 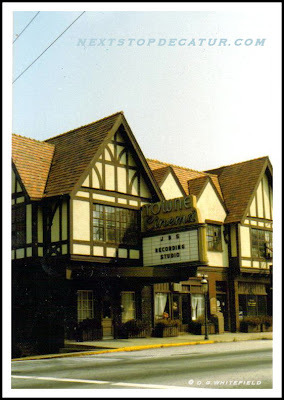 What Do You Think About a Movie Theater in Emory Village? Smothered, covered and - maybe - historical. That’s the application before DeKalb County, which is considering whether to make Waffle House #1 on East College Avenue a historic property. The county’s historical preservation committee will hold a public hearing on the nomination of the building, now a museum, at 7 p.m. Monday, April 20 at the Maloof Center in Decatur. The building sits just outside the city of Avondale Estates, which tried unsuccessfully for the third time this year to annex that and other property along College Avenue. The owners of the private museum were among the few business owners in the corridor who supported joining the city. 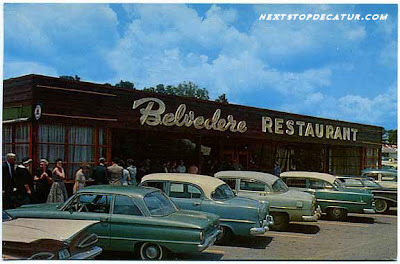 Back in the 1960's I remember this being a Drug Store which also soldIce cream. We bought all our ice cream at this place. PARK PLAN PRESENTATIONS BEGIN AT 1:30. DONATIONS TO SUPPORT THE CELEBRATION ARE WELCOME! TO BE THE CROWN JEWEL OF OUR NEIGHBORHOOD!!! 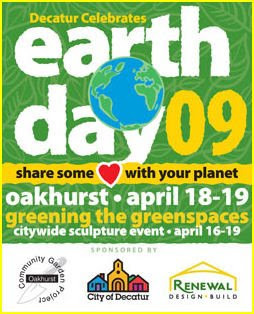 Candlelit concerts THE LAST FOUR Thursdays in April -- April 9th, 16th, 23rd, and 30th from 7-9pm in Oakhurst Village. FREE FOR ALL TO ENJOY! Kids are warmly welcomed. Please keep an eye on your own children at all times. We have some traffic on a nearby street and personal property at neighboring residences and businesses that could be potentially dangerous for unattended children. 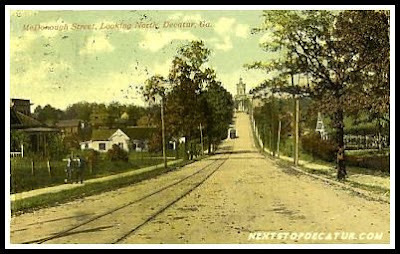 Photo taken from old Court House, Decatur Theatre on left side. All buildings on right side were torn down when new Court House was built in mid 60's. 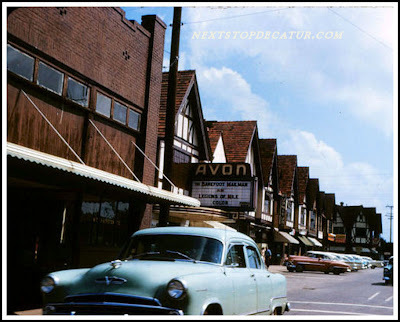 Looks like a Sinclair Gas station sign down on the right corner of Trinity & N. McDonough St.
Avon Theatre was original name of the theatre later changed to Towne Cinema. SQUASH BLOSSOM in DECATUR, GA.